Ambu CPR Mask 6-piece , reusable, easy-to-clean, pocket size CPR mouth barrier has a transparent dome and completely seals easily to the faces of infants, children and adults. The Ambu Res-Cue Mask helps protect rescuers in an emergency situation. Features a replaceable one-way valve with biological filter in one housing. Ambu Adult & Infant CPR Mask 6-piece , reusable, easy-to-clean, pocket size CPR mouth barrier has a transparent dome and completely seals easily to the faces of infants, children and adults. The Ambu Res-Cue Mask helps protect rescuers in an emergency situation. Features a replaceable one-way valve with biological filter in one housing. CPR Mask Kit Includes: Adult CPR mouth barrier w/transparent dome & Infant cpr mask, 1 pair Exam quality gloves, Alcohol prep pads, Instructions, soft carry bag with belt clip. CPR mask Dimensions: 5-3/4"x4-3/8"x1-7/8"
This Life CPR Mask is 1/2 the size of all leading "Pocket CPR Masks"
Invertably fits both ADULT and CHILD (patented). Superior seal of contoured soft medical PVC, conforms to all faces. One-way Valve and Filter provides hygienic protection which eliminates transmission of vomitus and contagious diseases. 3M Filtrete™ Hydrophobic Filter for maximum protection placed above the valve to prevent fluid contamination from victim. Clear CPR mask and valve allow excellent observation victim's color and status. 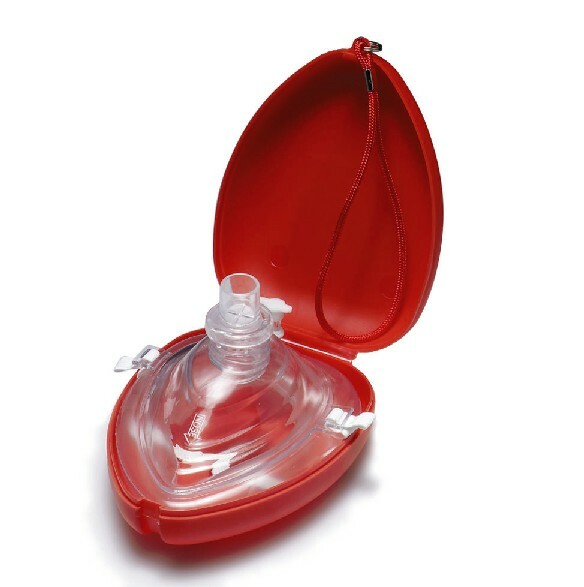 Ambu SPUR II is the only resuscitator that is made from a SEBS material instead of PVC. Our unique single-shutter valve has proven its reliability over two decades of emergency and hospital use. The crystal clear valve housing provides an unimpeded view of the valve operation, and the slim design makes it easier to view the mask. All Ambu SPUR II Resuscitators are equipped with a medication port that allows quick medication delivery.